Mega big wins on Dragons Myth slot at Microgaming Casino! The mysticism and adventure that is innately associated with dragons gives them a sort of magnetic attraction that is hard to ignore. It is, as a result, no surprise that slot developers have been creating dragon-themed slot titles for years. 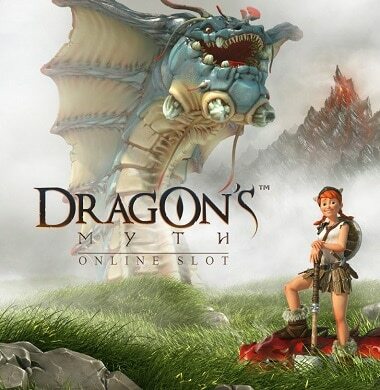 Dragons Myth is 5-reel, 20 payline dynamic video slot works on Rabcat’s software engine. This dragon-themed slot is exactly what casino players have been waiting for! As soon as it launched, it was clear that this slot was something special. With breathtakingly beautiful graphics and a hero avatar that fidgets when you are not winning and celebrates with you when you are. In addition, Dragon’s Myth’s list of bonus features is extensive with a chance to supercharge your winnings. Also, play for the slot’s massive Dragon’s Cave jackpot amount. The Dragon Bounty. With the appearance of a dragon symbol in the bottom right reel, players will trap the featured dragon and add it to their collection. Once a player has caught all 4 dragons, they will automatically receive the Dragon’s Bounty (a bonus amount relative to the amount wagered on the unlocking spin). Free Spins. The Free Spins feature will award 20 Spins when unlocked 5 symbols, 15 with 4 symbols and 10 with 3 symbols. The Dragon’s Cave. During the slot’s Free Spins feature, the appearance of the Bonus symbol on the reels will grant the player access into the legendary Dragon’s Cave. Once unlocked the slot’s symbols will change into the sacred dragon signs with an additional 3 Spins and the chance to supercharge any winnings. Every detail of the Dragon’s Myth slot has been considered from the spin button being integrated into the background graphics to the life-like mannerisms and expressions of the slot’s avatar. The attention to detail is in conjunction with the slots huge selection of bonus features. This in turn mean that Dragons Myth is a slot few will be able to ignore.